We have just published a paper in eLife that uncovers NPC1 as the first known genetic determinant of filovirus susceptibility in bats. This work was done in close collaboration with the groups of Sara Sawyer at University of Colorado-Boulder and John Dye at USAMRIID, and was an international effort that also involved a number of other groups from the US, Europe, and Asia. I have to say, it's quite a relief to get this paper out there. It been a long journey, with many twists and turns (read, journal rejections!) and it feels good to have landed this work in a high-quality journal. PhD students Melinda Ng and Esther Ndungo in my lab (pictured at left) helped drive this project and are co-first authors, together with Maria Kaczmarek in Sawyer Lab, who performed the evolutionary analysis on NPC1. Andrew Herbert in the Dye Lab carried out critical authentic virus experiments for the paper. The beginning of the story is Melinda's discovery that one of a panel of bat cell lines we acquired from co-authors Marcel Müller and Christian Drosten (U. Bonn) was resistant to Ebola virus entry. 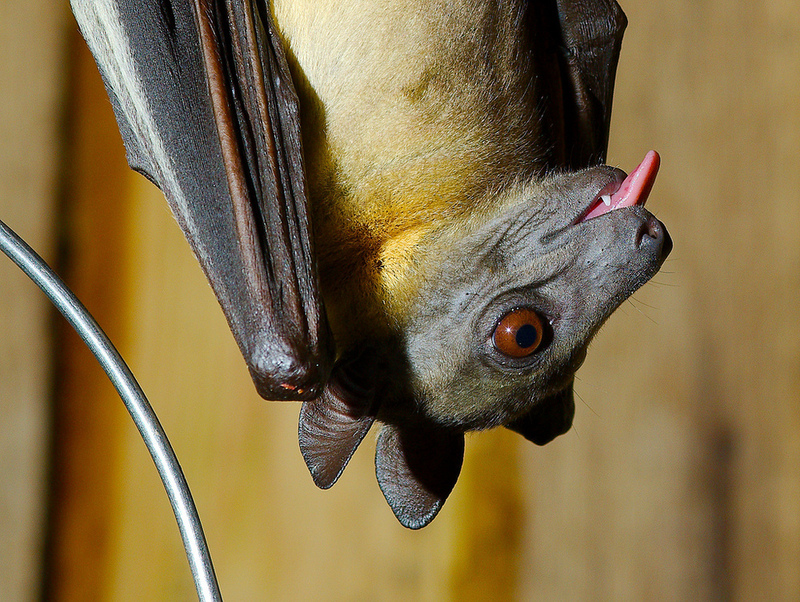 This cell line was derived from the African straw-colored fruit bat, Eidolon helvum (pictured at right). Following up on a hunch, Melinda was able to show that this resistance was due to the NPC1 gene in these bat cells. Moreover, she confirmed that the resistance was not a fluke of this particular cell line or the particular individual bat from which it was derived. Rather, multiple Eidolon helvum cell lines showed this behavior, suggesting that it was a broadly conserved property. Following up on Melinda's experiments, Esther uncovered the molecular basis of this resistance. She showed that Eidolon helvum NPC1 domain C (the part of NPC1 directly contacted by Ebola during cell entry) could not bind to the Ebola virus glycoprotein, GP. She then went one step further, by demonstrating that a single amino acid change in Eidolon helvum NPC1 was responsible for its molecular mismatch with Ebola virus. Intriguingly, the pattern of resistance, both at the level of infection and virus-receptor binding was highly virus- and bat species-dependent. Indeed, this pattern became clearer when we examined more bat NPC1s (figure at left).